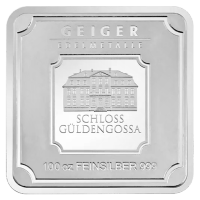 وجه العملة شعار جيجر إيديلميتال وصورة من المقر وعبارة "Geiger Edelmetalle Feinsilber 999 100 oz"
شعار جيجر إيديلميتال وصورة من المقر وعبارة "Geiger Edelmetalle Feinsilber 999 100 oz"
100oz Geiger Edelmetalle Security Line Silver Bar Gain peace of mind with your investment as these 100 oz bars have several unique security features that set them apart from their competitors. The Geiger Edelmetalle security line bars have been minted with a serrated edge similar to a coin to assure you that the bar has not been tampered with. In addition, each bar features a unique security label (similar to a serial number) that allows the bar to be traced all of the way back to the raw material it was refined from. Finally, the reverse of the bar is painted with UV sensitive paint so that they display the LEV rhombus and year of minting under UV light. A uniquely secure way to invest in precious metals!